With good collaboration, anything is possible. Up the coast from where I live in British Columbia is a one of our worlds natural treasures, the Great Bear Rain Forest. Its the context for an epic collaboration, involving environmental groups, government, forest industry and First Nations. 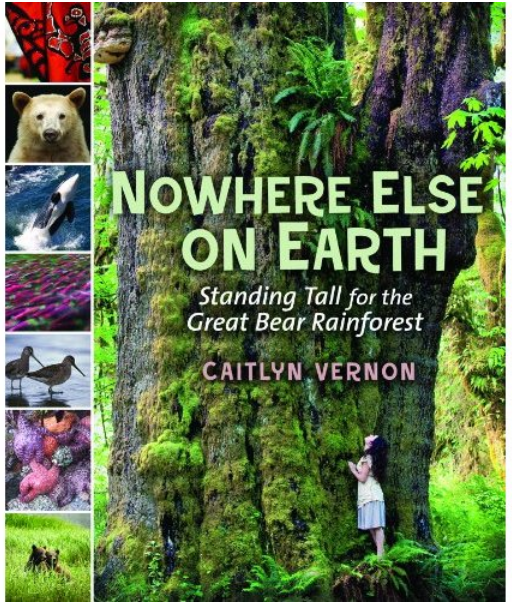 Its also the context for a fabulous book, Nowhere Else on Earth: Standing Tall for the Great Bear Rainforest. 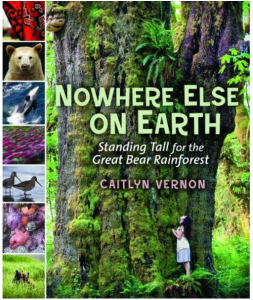 The author is Caitlyn Vernon, a coastal campaigner with the Sierra Club of BC. She also happens to be my niece (yippee!). A s I said, this is a fabulous book, and dont just take my word for it. This week, Caitlyn is in Virginia (USA) accepting a Green Earth Book Award for her book, courtesy of the Newton Marasco Foundation. For me, Nowhere Else speaks of sustainability, creative and successful collaboration, diverse people working together, resolving conflict… The book reminds us of the joy to be found in a positive relationship with nature. and who better to collaborate with! This book is rewarding on so many different levels. It would make an incredible resource for any school looking to incorporate a relevant, engaging book (plus there is an accompanying workbook) in their environmental studies program. It makes a great reference for family conversations. Its just plain fun to read. And, as a green gift, need I say more? You can get the book in paperback or as an ebook, in both pdf and epub formats from Orca Book Publishers. Its also available from the large book retailers (eg Amazon), and local stores, including on BC Ferries! I was thrilled to see your post, Ben, and not just because it highlights one of our planet’s priceless treasures. To know that someone – Caitlyn – has cared enough to make the effort to write this book, and to see it receive recognition, is tremendously heartening. Thank you for sharing this inspirational story with us, your readers. Thanks Susanna. Catilyn would be pleased to see your words. She certaintly tells the story with passion and verve, and is backed by a really strong publsihing team. A winning combination! It must be wonderful to have this to celebrate with your family. Makes Earth Day even more poignant. Indeed it does, Lorna. And, the Great Bear and Earth Day… sounds good together, doesn’t it! Thank you! And good to know about the guide. I hope you’re paying attention teachers!